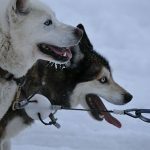 Is Your Dog Getting the Right Nutrition? Dogs, often known as “man’s best friend,” make remarkable pets because of their unquestioning loyalty and amicability. It’s no wonder you want to take great care of your dog. Being an ardent pet lover doesn’t, however, replace knowledge and understanding of your dog’s nutritional requirements. With contemporary techniques, it is possible to provide nutritious food for your dog. 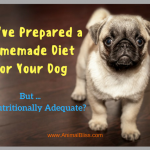 However, choosing the right food for your dog might be daunting with so many choices presented. 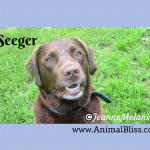 Read on to understand more about the ideal dog diet for your precious pet. A common assumption among new dog owners is that all pre-packaged dog foods have a perfect balance of nutrients, making them an ideal dog diet, which is not necessarily true. Healthy food for your dog depends on many factors. Your dog’s age should be a key consideration in choosing its food. Puppies usually require high-calorie content in their diet to support growth and bolster activity, and the same goes for lactating dogs. Like humans, dogs need balanced diets. 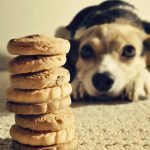 Reports say that a significant number of pet owners unwittingly give their dogs too much protein or carbohydrates, while some others feed their pets scraps from their own meals, which can be detrimental, if not balanced correctly. What can a dog eat? Despite being carnivores, dogs may have the occasional fruit or vegetable. Apples, bananas, strawberries, broccoli, celery, and cucumbers are some examples of vitamin sources dogs can consume in moderation. The ideal dog diet is a mélange of meats, healthy fats, and some fruits and vegetables. They contain all the required nutrition components for your dog. The sizes of dogs also determine what nutrients they need. Musculoskeletal problems are common in big dogs, so different types of food promote their growth. Small dogs may choke on some of the larger kibble foods, so they need different food as well. On top of this, specific breeds may have specialized needs. It’s advisable to consult a veterinarian to glean more accurate information about your dog’s dietary essentials. Dogs respond to a bad diet by suffering from chronic diarrhea, in which case, vet consultation is necessary. There are three general types of pet food: processed (which includes dry foods like kibble and wet foods); human-grade cooked pet foods; and human-grade raw pet foods. Processed dry dog food is cheaper and has several options from which to choose. It also has about 10% water. High-quality dry dog food to suit your dog’s age and conditions is ideal. Processed wet dog food is always canned and tastes better, and stimulate the appetite of picky eaters. Canned food stays fresh for far longer, but refrigeration is required after opening the can. Also, the water content in these is 75%. Here’s a chart with suggestions about the quantities of various foods to feed your dog, based on its weight. Human grade cooked pet foods contain human grade USDA ingredients, which implies natural nutrients, excellent safety standards, and less processing. Human grade raw pet foods resemble the ancestral diets of these animals, with raw meats, organs, and even bones. 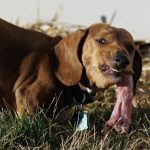 Because a dog’s digestive system is a lot more acidic than a human’s, the risks of bacterial contaminations are low, though not entirely absent. Feeding raw food to your dogs has its benefits. 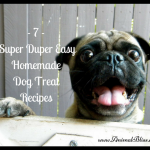 You can either feed a homemade raw dog food diet or opt for a commercially-prepared premade raw dog food. You can find a list of the best raw dog food brands here. Your dog will have healthy teeth and gums, resulting in a fresh breath. Veterinarian dental procedures are not required as much. The amount of earwax your dog has will decrease. Older dogs tend to become more active and energetic. Your dog won’t be as flatulent on a raw food diet. Controlling its weight becomes easier. Raw food aids digestion in dogs. 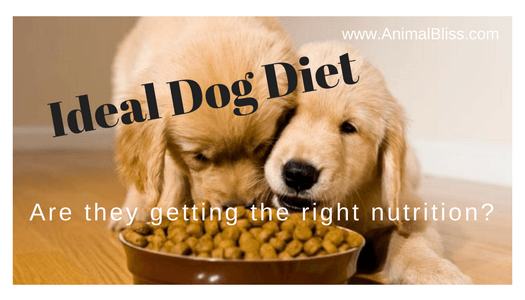 Ideal Dog Diet – How do you know your dog is getting the right nutrients? 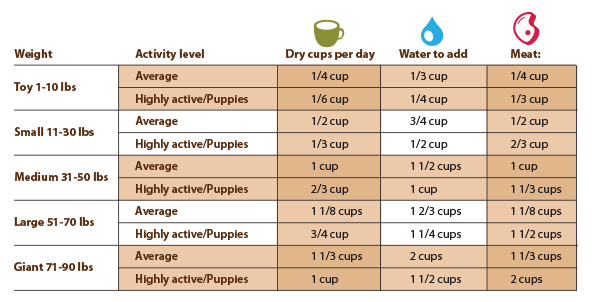 Note that water accounts for the majority of your dog’s weight and remember to keep him hydrated. Omega-3 and omega-6 fatty acids are responsible for proper joint growth, organs, and tissues and improve your dog’s heart health. The appropriate ratio of omega-6 to omega-3 fatty acids is in the range of 5:1 and 10:1. 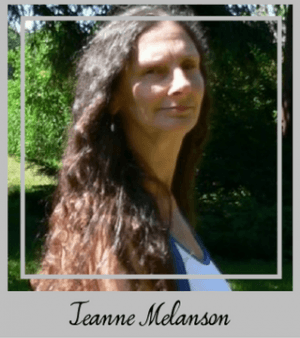 Flax seeds and flax supplements provide these nutrients. Natural synthesis of all vitamins is impossible, so make sure your dog ingests enough of them to stay healthy. Sweet potatoes, carrots, and papayas are excellent vitamin A sources, so mix them in with your dog’s food. Leafy vegetables and grains provide vitamin B2. Stunted growth, fainting, and flaking of the skin are some common symptoms of B2 deficiency, which is deadly as it can cause heart failure in dogs. Vitamin D deficiency can lead to rickets-like symptoms in your dog, and plenty of exposure to sunlight will help him synthesize this vitamin. Don’t over depend on feeding bones to your dog; bones have little food value, apart from the fats and muscles attached to them. With enticing business opportunities for medical healthcare and food processing industries, you can be assured that your dog can get the best care he deserves. Invest thought in choosing the ideal dog diet for your pet, and you can be sure he’ll thank you for the health and wellness you endow upon it. Do you feed your dog(s) a natural or raw diet?